Indians are big on savings – they probably save more than any other country in the world. This has put Indians (42% of them) amongst the ones who are very well prepared for their retirement. These are the findings of recently released report by HSBC Insurance – Future of Retirement – which put across many interesting findings about how well prepared people are for their retirement. 2 What are the motives for savings? 4 How long the Downturn will last? Globally, almost 87% feel that they are not well prepared for their retirement, while only 58% Indians are not satisfied with their retirement savings. Conversely, South Koreans (98% ) are the highest. What are the motives for savings? Although, Indians are big on savings, do you know what they save on most? yes, you got it right – Children. 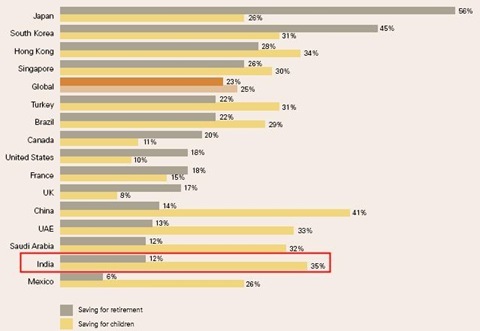 Most of the Indians (35%) save their money for their Children, while only 12% of all savings go in the retirement kitty. While Japanese (56%) and South Koreans (45%) save for their retirements, China (41%) and India (35%) save for their Children. It is interesting to note that all the developed economies save more for their retirement rather than for their children. While Emerging Economies, like China, India, Mexico, Brazil & Turkey save for their Children more than they do for retirement. 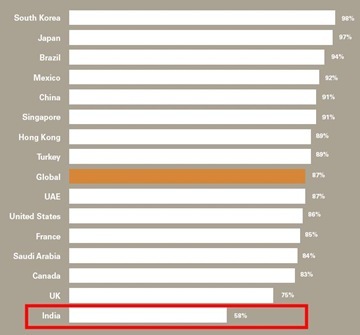 One of the surprising findings was that close to 87% of Indians have access to financial guidance, which is maximum amongst all the countries surveyed. The survey points out that only 13% of all Indians have not accessed any financial guidance. In India, people see their employer as a useful channel for financial information. It is notable that people in both these countries have an appetite for learning about finances through all channels – which is not widely shared in other countries. This helps to explain why the education gap is lower. In China, it stands at half the global average. 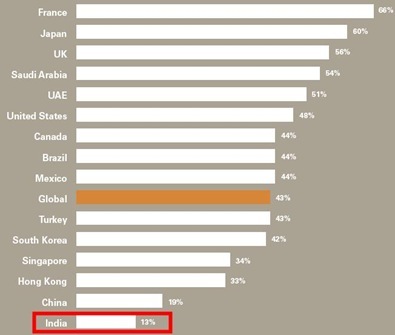 In India, the gap falls to just one-third of the average. How long the Downturn will last? Again, when it comes to optimism about Economy, Indians are in forefront. 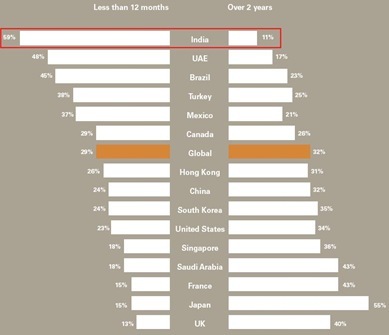 Indians (59%) feel that this downturn will last less than 12 months, while only 11% feel that it will stretch for more than 2 years. While on the other hand Japanese (55%) are most under confident about the economy picking up anytime soon. There are many more interesting highlights and analysis in the 65 page report released by HSBC. You can download it for further reading from here. Thanks for pointing to the report and the review. It is an interesting read. – We hear from parents that “saving is a good habit” and start saving for a bike, marriage, house, retirement etc., which is a great thing. By living abroad I know that outside the borders too Indians save consciously compared to other nationalities. – Page 2 of the report states “58% of people do not know what their retirement income will look like”. I think individual learning and planning is required here. Also, the country’s education system can include topics on financial planning in high-school to early college as it is a good age to grasp the topic as also some students begin to take family responsibilities. Needless to say, as adults we are responsible for our own finances and further, as parents, we need to be able to teach our children the importance of savings and financial planning. This can go a great way in improving financial condition of the society. – One should comprehend the impact of inflation on one’s savings. One cannot put money in FD’s and hope to have a great retirement. People who retired a decade ago are probably worse off today due to increased inflation. Nobody excepted dal and vegetables to be priced 5 to 10 times what it was when they took retirement. I think the saving nature of india was one of the reason to take India out of recession… Now when we are almost on the recovered stage, we can say that we survived with less tension coz most of us had some savings in our hand. Whether it is saving for children or for your retirement, it do help surviving hard times. Wat say? Sharad you are absolutely right – Savings help, in what ever form it may be – In emergency everything helps. Having said that, I just dont like people saving obsessively – They just save and forget how to spend even if they have pretty much everything covered.